The team I work in at FreeAgent is achieving great things – from rolling out a new Business Intelligence tool, to working on machine learning models to improve our product. With so many ideas but not enough time to action them, we recently advertised a number of roles to expand our team. FreeAgent is a superb place to work, and the roles are a real opportunity for someone to achieve a lot personally and professionally, so I probably should not have been surprised by the volume of applications we received – but I was! We had applicants from all around the world, and the vast majority of them had a compelling set of skills and experience on their CV that made them viable candidates – but I knew that recruiting the right candidate was incredibly important. Estimates vary in how much a poor hire can cost a business in financial terms, but it is clear that bad hires do have some adverse impact on finances, as well as negative repercussions for employee morale, productivity and engagement. They also carry with them a larger risk of causing reputational damage to the business, and so I was determined to get it right. Having written the job spec, I knew what the role entailed. I knew which skills would be needed. But I still found it hard to assess many candidates – one may have strong analysis skills on their CV, but less experience of stakeholder management. Another may have less analytical experience, but appear to be very technically proficient. In short, they all had some skills that fitted aspects of the role, so how could I fairly and rationally progress some applications but not others? After a few sessions of trying to review applicants, I hit upon a method that seemed to work; I chose two aspects of the role that were the most important, and plotted them on axes to make a quadrant chart. I could then mark areas on the chart which would indicate suitability for the role. Thinking about where each candidate fell on these axes helped me to assess the applications in a timely manner, and – more importantly – to progress the applicants with the best chance of succeeding in the role. 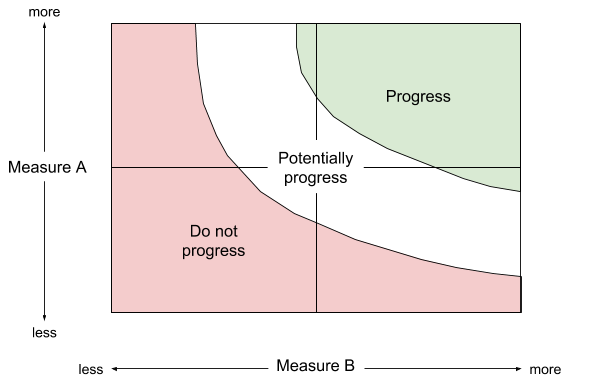 If there was a candidate that was hard to place, or that fell outside of the progress/do not progress zones, the chart was a useful tool to frame the discussion. It definitely helped to clarify things during the review process, and is an approach I will consider using again the next time I am bogged down in CVs.